These paint splattered starting Pokemon posters will cheer up and give an artistic look to any room in your house. But who will you choose? Always the tough decision… I suppose it doesn’t matter as your rival is bound to pick the better Pokemon anyway. Now you can get inside of the skin of Catbus! 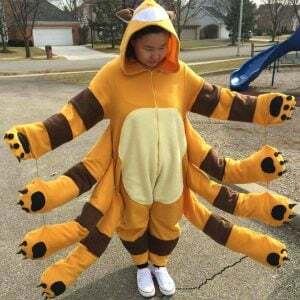 Inspired by the transporting animal bus-looking character in My Neighbor Totoro, this handmade Catbus onesie comes with a hood and four pairs of legs to give you your next big cosplay idea. It’s all fun and games until someone loses an eye! The Nintendo switchblade pin offers all the fun of the video game console with a significant dose of danger. It’s flair is suited for the avid pin collector who isn’t afraid to stomp on a Goomba. This Question Block cookie jar is full of delicious mystery! Simply pull up on the handle and peek inside: will you find power-up mushrooms, coins, or something else? Hopefully you find some Yoshi cookies! Are you the king of games? Show off you’re a believer in the heart of the cards and ready to duel anyone, anytime with this Millennium Puzzle printed t-shirt! It’s the perfect gift idea for the avid Duelist in your life. Imagine pulling out one of these cards in a duel! These fan made Yu-Gi-Oh cards and are probably not tournament legal but are fun for casual duels or the deviant card collector. They’re available in holographic versions too! Never has being a serial killer become so fashionable as you wear the Death Note messenger bag by your side. Coming with the Death Note rules written inside, you’ll have a truly unique shoulder bag to store your valuables in. Treat yourself to a super cute and cuddly Dango plush! Everyone member of the Dango family comes nice and soft with just enough firmness that makes them great for snuggling. You don’t even need to be a fan of Clannad to find these adorable! These hilarious window decals are ideal for Naruto fans who like to drive way too fast! The easy to apply stickers will make it look as though you’re putting the pedal to the metal when you have a character’s face pressed against the back or side window. Enjoy the thrill of risk-taking and owning it all in the world of Street Fighter! This custom game board features iconic fighting arenas from the video game franchise and includes six playable collectible tokens which were voted by fans. Please your inner Magical Girl by inserting these Sailor Moon leggings into your wardrobe. Each pair features a gorgeous custom design of Crystal Star symbols that’ll have you falling in love the first time you put them on. This shadow box showing an epic Pokemon battle is the perfect gift for fans and makes a great addition to your gaming room! Each sprite meticulously is cut by hand from alloy plastics and painted ready to be hanged on your wall. Pokemon has finally made its way into the furry fandom subculture. Walk around in the skin of the Pokemon you associate yourself most with in a professional grade custom fursuit. Features a hindged jaws and built in fans.